illustrated in the above map. From Ordnance Survey sheet CXXIII.7 surveyed in 1912. Stoke Damerel Parish Church from the south-west. For over four hundred years Stoke Damerel Parish Church served the ancient manor and parish alone. It is of uncertain date but certainly existed by 1292 as it is recorded in the "Taxatio Ecclesiastica" of that date. The Church was always believed to have been dedicated to Saint Andrew and Saint Mary. It is now dedicated to Saint Andrew and Saint Luke, the latter being taken from a former Mission Chapel in Richmond Walk. 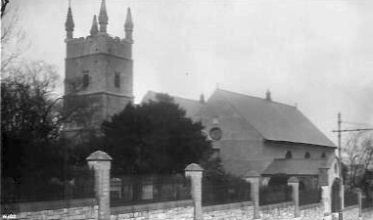 Originally the Church comprised just a nave but the as the population of Plymouth-Dock grew an aisle was added on the north side in around 1715 and a second aisle in 1750 on the south side. This had the effect of making the Church wider than it is long. The tower is reputed to be the oldest part of the building and the oldest building in Stoke Damerel and contains a peel of bells. The Church contains a number of memorials and monuments. A gallery was then added to the west side and an organ was installed. A new peel of bells was hung in 1789. A clock was installed in the tower in 1811. It is inscribed with the names of the churchwardens, Messrs Richard Rodd and George Snowdon. The chancel was added in 1868. Restoration work was carried out in 1883. Following a proposal to endow Devonport with parish church more worthy of the Town, the eminent architect Mr William D Caröe (1857-1938) designed a new Church and a new Rectory to be erected in Great Sanctuary Field, north of the existing Church. The foundation stone was laid in 1902. The work was to have been carried out in four stages but only the Lady Chapel and Rectory were completed before the plan was abandoned. In 1904 further restoration work was undertaken. 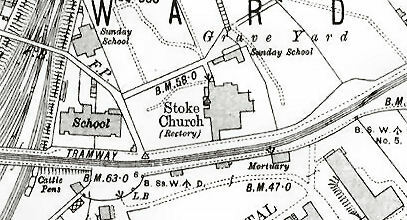 Stoke Damerel Parochial School was opened at the rear of the Church in 1860. In 1789 and 1819 the burial ground was extended but when the Plymouth, Devonport and Stonehouse Cemetery opened in 1849 many people were buried there instead. The burial ground was closed by 1870 and a new one opened at Milehouse. The "Taxatio Ecclesiastica" and the parish registers are held by the Plymouth and West Devon Record Office at Clare Place, Coxside, Plymouth, PL4 0JW.